Worldwide, thousands of technology companies are viewing the Internet of Things and the Smart Home as the Holy Grail for their products and profits. Most industry analysts and leaders are predicting that hundreds of millions of homes will want these new technologies. However, before the device makers begin to design and develop new solutions, they need to understand that this market is rapidly changing and evolving, especially when looking at the Smart Home and the consumer electronics market. This is a moving target that manufacturers need to understand. First off, the Internet of Things – especially for the Smart Home, is not about things, but instead, is about services that will make consumers’ lives more comfortable, more secure and more efficient. Energy control, security, improving the efficiency of daily life, etc. Unfortunately, the label of the IoT with the word “things” puts many people on the wrong path of thinking. Things are the necessary enablers, but the complete solution includes data analytics, smart phone apps and billing/support systems as well. There is an entire ecosystem at play, in which things play a (minor) role. Also, many people confuse IoT things with connected devices. It is not enough to just web connect a device – it needs to be able to speak to other devices and systems in the home, as well as to be able to become smart – to utilize web intelligence, so that is more than just a remotely operated sensor or actuator. The Internet of Things and the Smart Home is not about pushing products (“things”) out of the door, but it is about reinventing products into services. Internet of Things business models are about recurring services and recurring revenue streams, not (only) about paying for a product at the check-out register. Customers are buying solutions for problems, real or perceived. They are looking very specifically for things like “security”, “energy control”, “assisted living”, etc. And they want to be able to monitor and control these different solutions from the same place – a single dashboard. They don’t want to have to use a variety of different apps with different user interfaces (UI) to manage their homes and their family’s life. Manufacturers and service providers need to work together – to bring all the different home equipment and services together under a single umbrella with a common UI – a single app (Smart Home Butler) that lets the family members, understand what is happening in their home and enable them to manage it, if not managing it for them. 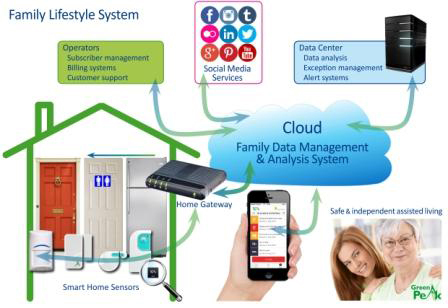 The Family Lifestyle system uses sensors, connected devices, cloud intelligence, and social media to combine a variety of important services into a simple to use app that enables service providers to make their customer’s lives easier and more secure. The Smart Home is a wonderful concept, but concepts alone do not solve immediate customer needs. For example, no one is looking for a refrigerator that can talk with the toaster – but if these kinds of kitchen appliances can help make the home shopping task simpler, if the connected appliances can make it easier to schedule and prepare meals, then maybe this really is an effective solution that people are interested in. Device makers need to be very precise in what problem they are solving for their customer, and evolve away from simply marketing the “concept” of connected devices. The end game is connected solutions that make our lives easier, safer and more efficient. Device makers and service providers need to look at the BIG picture, not just the components and the individual machines and devices. Cees Links is the founder and CEO of GreenPeak. Under his responsibility, the first wireless LANs were developed, ultimately becoming household technology integrated into PCs and notebooks. He also pioneered the development of access points, home networking routers, and hotspot base-stations. He was involved in the establishment of the IEEE 802.11 standardization committee and the Wi-Fi Alliance. And, he was instrumental in establishing the IEEE 802.15 standardization committee to become the basis for the ZigBee sense and control networking. GreenPeak Technologies is a fabless semiconductor company and is a leader in IEEE 802.15.4/ZigBee silicon solutions for the Smart Home and the Internet of Things. GreenPeak is privately funded. It is headquartered in Utrecht, The Netherlands and has offices in the United States, Belgium, Japan, China, France, India and Korea. GreenPeak has won the prestigious 2014 Deloitte Fast50 Award and is recognized as a leader in developing new wireless technologies for consumer electronics and Smart Home applications, demonstrating rapid growth and adoption by major customers.